George Pataki served as governor of New York from 1995 through 2006. He announced his presidential candidacy in May 2015. Pataki is widely regarded as a moderate Republican, a reputation that undoubtedly helped him to win repeatedly in liberal-leaning New York. He defeated incumbent governor Mario Cuomo in 1994, in perhaps one of the biggest political upsets in the country in a very pro-Republican election. He campaigned as a reformer who would shrink government, and early on in his tenure he delivered big tax cuts and a real reduction in state spending. Later years of his tenure saw rising taxes and spending, although he did leave office with fewer state employees than when he arrived. Pataki was largely overshadowed by Rudy Giuliani in terms of leadership during the 9/11 terror attacks on New York, but most people give him substantial credit and praise for how he handled and helped to steer the state through the crisis. When his potential 2002 Democratic opponent Andrew Cuomo criticized Pataki’s performance, the blowback to him was sufficiently fierce that he was forced to abandon his plan to challenge Pataki. Although Pataki has won multiple impressive victories at the ballot box and hails from one of the largest states in the country, his campaign is seen as something of a long shot. His moderate views on social issues combined with low name recognition, middling-at-best communication skills, and a fiscal record that is likely to draw criticism from small-government conservatives pose real challenges to his candidacy. Pataki has been at or near the bottom of the pack in terms of fundraising and polling so far during the 2016 nomination process and has yet to move up into even the third tier of Republican candidates. Since he is an experienced politician with a record of substantial political success, it could be that the skills and views that allowed him that success are specific to New York’s political environment and will not bring him a similar level of accomplishment outside of the Empire State. Without a series of major stumbles by candidates ahead of him or some other stroke of luck, it is difficult to see a viable path to the Republican nomination for Pataki. George Elmer Pataki was born on June 24, 1945. He is the son of Louis P. Pataki, a mailman and volunteer fire chief, and Margaret Lagana Pataki, a homemaker. He was raised in the family’s farm in Peekskill, N.Y.
Pataki attended Peekskill High School, graduating in 1964. He received an academic scholarship to attend Yale University, graduating in only three years. During his college years, Pataki served as chair of the Conservative Party of the Yale Political Union. He earned his J.D. from Columbia Law School in 1970. He went on to practice law at the Peekskill firm of Plunkett and Jaffe, P.C. Pataki first ran for office in 1981, defeating the Democrat incumbent mayor of Peekskill by earning 70 percent of the vote. He was re-elected in 1983 with 74 percent of the vote. Shortly thereafter he ran for the New York State Assembly, defeating a one-term Democrat incumbent with 53 percent of the vote in 1984. He increased his margin of victory two years later in a rematch, earning 63 percent of the vote, and was easily re-elected again in ’88 and ’90. After being redistricted out of his state assembly seat in 1992, Pataki challenged a seven-term incumbent Republican state senator, winning the primary election 52-48 percent. He won a four-way race in November that included the incumbent, who ran on a third-party ticket. Pataki ran for the Republican nomination for governor in 1994 despite low name recognition, receiving a major boost when he was endorsed by popular Republican U.S. Sen. Alfonse D’Amato. He won the nomination to face heavily favored incumbent Democrat Gov. Mario Cuomo, narrowly winning by a margin of 48.8 to 45.4 percent. He easily won re-election in 1998 and 2002 and elected not to run in 2006. After leaving office he joined the law firm of Chardbourne & Park, focusing on renewable energy issues. He would later go on to found an environmental consulting firm, the Pataki-Cahill Group, along with his former chief of staff John Cahill. He went on to work on climate change issues with the Council on Foreign Relations and former Gov. Tom Vilsak (D-IA). In 2007, Pataki was appointed by President George W. Bush as a United States delegate to the United Nations General Assembly, with plans to focus on climate change and terrorism issues. Pataki has been married to Elizabeth “Libby” Rowland Pataki since 1973. Together they have four children: Emily, Teddy, Allison and Owen. Allison, also a Yale graduate, is a published novelist. Teddy and Owen are serving in the military. Emily is an attorney. Pataki is a Roman Catholic. Pataki’s administration faced several serious ethical charges, although none were tied directly to Pataki and there was no evidence he knew about the corruption that occurred. It should be noted that New York government is mired in corruption, and it would be virtually impossible for any governor in the state to not to have some corruption occur by their staff. Still, as governor Pataki bears the responsibility of his administration and campaign team’s actions. In another corruption scandal, a campaign aide, a fundraiser, and top parole officials exchanged campaign contributions for promises of early release for several violent criminals.4 According to the prosecutor in the case, there was no evidence Pataki had any knowledge of the scheme. In terms of keeping campaign promises, the general fund grew by 67 percent between 1994 and 2006 and state taxes increased by a net of $3 billion,6 contrary to his pledge to make New York’s government smaller7 (although the number of state employees did decline by roughly 4 percent under Pataki8). “By the end of his second year in office, Pataki was abandoning the fiscal conservatism and promises of reform that he’d campaigned on – and he never looked back. “Pataki broke virtually every political promise he ever made. “Before taking office, he said he wouldn’t put his name on state Transportation Department signs that greet motorists entering New York because it was wrong to use public monies for self-promotion. Instead, he put his name, face and voice in more than $100 million worth of state-financed TV and radio ads. Throughout his political career, Pataki has demonstrated considerable political skill, having scored a number of upset defeats of Democrat incumbents in heavily Democratic New York State. In winning a seat in the New York State Senate, Pataki defeated a seven-term incumbent Republican. In his first campaign for governor of New York, Pataki successfully closed a 10-point deficit against popular Democrat incumbent Governor Mario Cuomo to win by 3 percentage points.16 He was one of only three Republicans to win the governorship of New York since 1923, along with Thomas Dewey and Nelson Rockefeller. He has never lost an election. Pataki’s leadership following the 2001 terror attack that brought down the Twin Towers of the World Trade Center was generally well regarded, although overshadowed by Rudi Giuliani’s leadership as mayor of New York City.19 In addition to his leadership following the 9/11 attacks, Pataki’s other major achievement in office was the significant income and corporate tax cuts made early in his first term, dramatically lowering taxes for New Yorkers. In 2003, Pataki helped to create the Regional Greenhouse Gas Initiative (RGGI), a cap-and-trade program between states in the Northeast and Mid-Atlantic region aimed at reducing carbon emissions in an effort to fight climate change. The New York Times has reported that the states involved the RGGI program have reduced their carbon emissions by 18 percent since 2009. 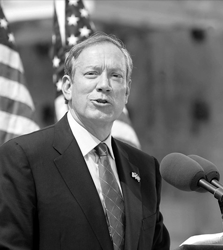 Pataki has stated that he was “fully supportive of President Bush’s ambitious agenda for trade liberalization.”43 In 2005, he led a trade mission to China to promote foreign investment in New York State.44 He was desirous of opening up a trade office in China but was unable to secure funding for the office in the following year’s budget. He was also supportive of the construction of the Barclays Center in Brooklyn.62 The sporting arena received more than $1.6 billion in public taxpayer financing, and the project frequently used eminent domain to acquire the land on which it is constructed. Pataki’s governorship was, in many ways, defined by his handling of the September 11th terrorist attacks on New York City. Along with New York City Mayor Rudy Giuliani, Pataki was widely praised for his handling of the aftermath of the attacks. On political speech, Pataki proposed dramatically reducing campaign contribution limits in New York and more tightly regulating issue ads,85 both of which would have been serious setbacks for First Amendment rights. Pataki’s primary vulnerability is his reputation as a moderate on social issues, which is likely to make him unappealing to many in the Republican Party’s more conservative base. Pataki also lacks any significant grassroots support. He has been out of political office since 2006 and, as such, has largely been out of the national spotlight since then. He is also vulnerable to charges that he is a product of a corrupt political culture. While there were no serious allegations that he directly participated in or even knew about corruption in his administration, a few high-profile scandals did occur during his office involving top administration and campaign officials. Pataki will also have to deal with a reputation from his years as governor that he is a big-spending Republican at a time when fiscal issues are at the forefront for many Republican voters. After his campaign promises to rein in spending and taxes in New York, Pataki was admonished by critics for failing on these counts. During Pataki’s tenure as governor, state spending grew by 79.5 percent between 1994 and 2006, and state taxes increased by a net of $3 billion. Pataki is also the oldest candidate in the race. If he won, he would be the oldest person ever elected to the presidency.